Grow Happy Cook Happy Be Happy is a cookbook which focuses on using seasonal produce as much as possible and often using ingredients which can be grown in your allotment or garden. We have started a small vegetable patch this year and it has been very exciting using home-grown rocket in our salads and courgettes and mange-tout in stirfries and curries. Our carrots, beetroot and leeks are still growing but not quite ready yet. There is something very satisfying about using very fresh ingredients you have tended and grown yourself. 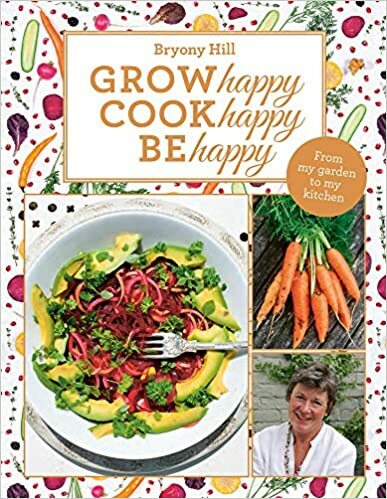 Grow Happy Cook Happy Be Happy is full of recipes as well as cookery tips and gardening suggestions too. It is split into seasonal sections with something for every day of the year be it a recipe or some ideas. As well as the recipes, there are mouth-watering photographs of the finished dishes. These were taken by the author herself and there are also photos of flowers, fruit and vegetables and even some of the wildlife that visits her garden. What better way to review a cookbook than to test out some of the recipes? That’s what Kelly from LoveBooksGroup and I did on Monday and cooked ourselves a delicious three course lunch. It was quick and easy and great fun to have a blether as we were cooking. She’s not a bad sous-chef! Most of the recipes are very simple to make and can be easily adapted to make larger quantities. We did this so I would have some food ready for my family at teatime. Our first course was ‘Not Too Mushroomy’ soup. This was simple to make with carrots, onion, celery, mushrooms of course and stock. It smelled wonderful when it was cooking and tasted delicious. A perfect soup for a breezy Autumn day. Our main course was Lime and Ginger chicken which we had with a mix of long grain and wild rice which I added some frozen chopped coriander to. The chicken was marinated in soy sauce and lime juice, with fresh ginger, chilli and garlic. It was very juicy and tender. The ginger gave it a real kick though I think we should have added a bit more lime juice. Finally our dessert, an autumn classic – a crumble. It should have been apple and raspberry but in keeping with the spirit of the book, I picked some brambles from the garden. It was made a little differently from how I usually make crumble as the fruit wasn’t stewed but just baked in the oven with an oat and almond crumble topping. I felt it was a little drier than I prefer but perhaps should have added more apples. It certainly looked and tasted good though. I really recommend this cookbook if you are keen to try cooking more seasonally whether you are able to grow your own ingredients or buy them at the shops. There are so many recipes to inspire you to get busy in the kitchen and most could be easily adapted to suit your own tastes or what ingredients you have available or how many people you are feeding. There’s nothing more satisfying than growing your own produce, and then using it to make a delicious home-cooked meal. But whether you are catering for the family or simply cooking for one, now it couldn’t be easier to grow, cook and enjoy your very own home-grown, tasty food. Grow Happy, Cook Happy, Be Happy is full of practical gardening advice, cookery tips and mouth-wateringly easy-to-make recipes that will make you happy inside and out. Bryony Hill’s unique, friendly style and instinctive warmth, guides you through the months of the year on a journey from garden to kitchen, that will have you making the most out of whatever outdoor space you have, and whatever ingredients you have grown. Bryony Hill was born and educated in Sussex and, after a year at Brighton Art College, she lived in France, returning to London in 1975 where, shortly afterwards, she met her future husband, ex-professional footballer and television pundit Jimmy Hill. In 1985 they moved back to her home county where she learned to garden in earnest the vegetable plot taking priority. There remained one wish and, when she eventually convinced Jimmy that a few chickens had to join the family, their rural idyll was complete. Grow Happy, Eat Happy, Be Happy is Bryony’s 7th book and she now has the time to develop her passion for photography alongside continuing to experiment with recipes and cooking what she has grown for friends and family. Fabulous post Joanne. Love the fact you and Kelly did it together….What fun! Lots of lovely recipes Yvonne. It’s so satisfying to use your home-grown produce isn’t it? I love it, I’m making jams and chutneys at the moment and then making and freezing butternut squash soup. I enjoyed a lovely three-course tea earlier this week cooked from this book and can confirm it was fabulous! Steve. What a great way of reviewing a book like this – really enjoyed this post!